For most startups and small businesses, the hardest part is coming up with a realistic marketing budget. With limited money at hand, the marketing budget is driven not by what 'should' be done but rather what 'can' be done. But just focusing on the 'can' and leaving 'should' aside can lead to failed marketing campaigns. It should always be a healthy mix of 'should' and 'can'. Let's explore how. Myth: There's no limit to how much you can spend on marketing. 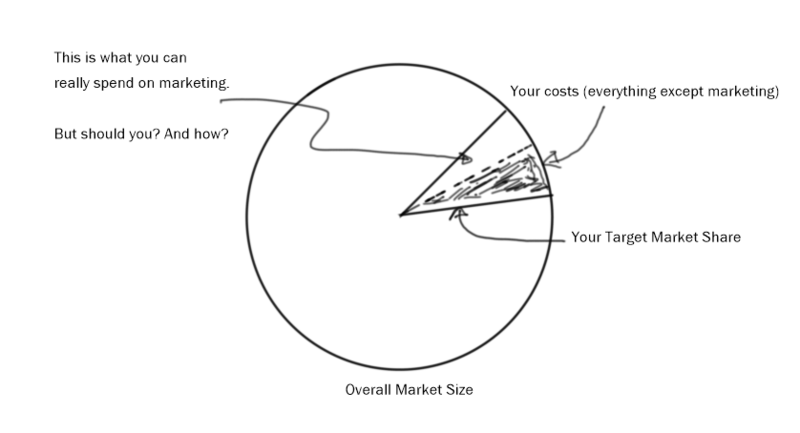 Reality: Smart marketing teams know how much they can and should spend on marketing. Answer the 'can' first. For this, carefully study your target market. Answer the key fundamental questions, such as how big is my market segment? What drives my target audience to buy? How much profit margin do I need to run a healthy business? Knowing this will give you a very good idea of how much you 'can' spend on marketing. For example, let's say you sell luxury watches through your local store. An average luxury watch costs say $1500 and your local potential market size is 500 people. So you know the maximum revenue you can make would be $750K. With this revenue number in mind, and your costs and target profits, you can come up with the maximum amount of money you should put on marketing. Myth: When it comes to marketing, you should try everything. Reality: Smart marketing teams focus on the marketing tactics that produce best results at least cost. Sure it's hard to figure out what marketing tactic is best for your situation. And in fact the tactics change with time and with the kind of market segment you are dealing with. So be agile and keep an eye on marketing performance. Adapt and change quickly. You know your marketing budget; treat it like your investment. Play with those marketing dollars carefully. Review your numbers daily and weekly and charge course as needed. It's not about doing everything; it's more about what to do when and how. ellipsis helps small businesses and startups come up with realistic marketing budgets, be smart and agile about using those marketing budgets at the right places, and keep a close eye on overall marketing performance. Contact us for a personalized demo today!